Office removals are regularly completed with our proficient service including the dismantling/rebuilding of desks of all styles and positioning in place ready to be worked from. Filling cabinets are safely moved on our sack barrows along with stationary cupboards and other heavy items. 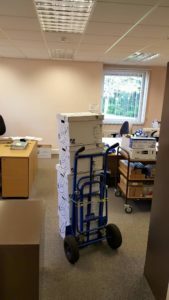 Archive boxes can be moved and placed in order at the next destination photo copiers and other printing equipment is cared for along with computer equipment telephones etc. Racking can be dismantled and rebuilt ready to store everything once again neat and tidily. A packing service can be arranged if needed and we can ensure the delivery of an individuals personal equipment and chair is positioned correctly at their work station. We have moved some well known businesses with large offices for 50+ staff and have the experience and knowledge to get it done right for you.